This week and a half has been a week of testing for Aiden, he seems to feel comfortable now in his environment and has begun testing us with a vengeance. I guess I should have known this would come sooner or later, but it was like it had all come about all of a sudden. He is such a good boy, but this week he has chewed the plug off Huib’s power saw, then once it was fixed he decided to chew the entire cord off. In addition to this he has chewed my flip flops and decided that obedience is not in his vocabulary right now. I guess now is truly when the fun begins. So he is close to being the same height and length as Cessna and even weighs almost as much as she does. I think he is going to be huge when he finishes all this growing! Last Wednesday (June 18) was Aspen’s 5th birthday. 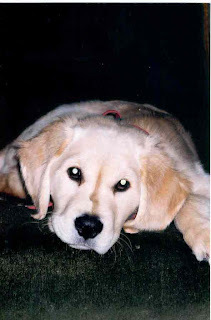 I can’t believe it has been that long since we picked her up on August 8th, 2003, I guess time does fly. She was so cute when we got her, not that she isn’t cute now, but she was adorable back then. She looked like a yellow lab puppy and would run with Phoenix, but then all of a sudden decide to stop and sit…poor Phoenix couldn’t stop as quickly so would run right over top of her. 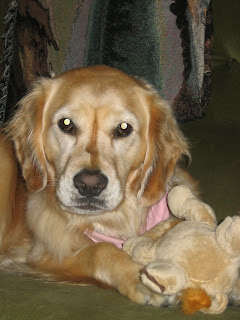 Aspen would begin yelping and crying and run back to Huib and I…she was such a drama queen! I remember a couple of days after we had gotten her my aunt and Huib were dropping me off at a camp for the week and my aunt almost fell down their crazy steps. She was carrying Aspen so as she fell she made Aspen roll out of her arms and onto the ground so she didn’t get hurt. Well Aspen laid there on the ground for a full 5 minutes not moving e ven a hair, my poor aunt thought she had hurt my puppy. Well all of a sudden Aspen got to her feet and began running around like a crazy puppy! Well it has been almost 5 years since then and she is still as dramatic as she used to be and Phoenix is still her best buddy. She likes Cessna and Aiden, but she absolutely loves Phoenix and sometimes we think she wishes he’d go get his battery changed or get a new engine. She will run circles around him trying to get him to play with her, but he just doesn’t have the energy to do it these days, I’m not sure what she will do when her best buddy is no longer with us. For her birthday this year she got a stuffed pink teddy that squeaks and a pool to play in when it’s warm. Last Tuesday (June 17) we took the dogs to the Rockwood Conservation Area to swim. They had such a great time, swam for over 45 minutes and then we went for a walk to the caves and back. It was pretty cool out though so we didn’t get to enjoy our trip overly much, hopefully the warmer weather will soon return. In In the evening though Cessna began to scream whenever she would sit or try and “swish” her tail (Cessna doesn’t wag, she swishes). I was so upset about her screaming because I knew immediately what had happened. She has rudder tail again, she had gotten it the first summer I had her and now again L Rudder tail is from swimming too fast, too hard and for too long…it is sort of like they sprain their tail. I had a feeling I shouldn’t have let her swim so much, but she was having such a great time I didn’t want to make her stop. Well we gave her an Aspirin and it seemed to help dramatically, within about half an hour she was able to sit comfortably. As of Saturday she was fine and her tail no longer looked like it was just pinned to her. This week has been busy, but fun at the same time. Saturday we were supposed to go to the Multicultural Festival in Kitchener, but it was storming like crazy…the weather these past few weeks has been nothing we’ve ever seen before. 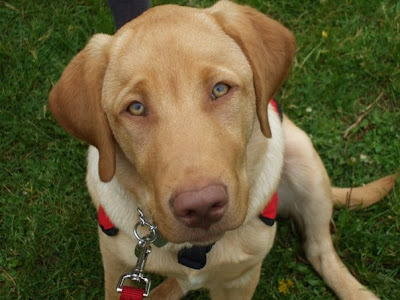 On Monday Cessna, my sister and I all headed to Toronto to visit with my friend Lynette and her new guide dog DeeDee. DeeDee is so tiny and so cute. She wasn’t overly sure about Cessna with her energy, but I think after a few times of seeing her DeeDee will understand that Cessna is just playful. This coming weekend we will be having a birthday party for Aspen (5th) and Aiden (6 months). We invited about 15 different dogs and their moms, but only 12 will be attending including my gang. I will post pictures if we get some good ones, last time we had a party for Aspen the pictures didn’t turn out overly well. I know it sounds weird to have a birthday party for your dog and to invite so many other dogs, but I am who I am and well my dogs are not just dogs to me, they are my family. I am always being told that I have too many and that I should get rid of some, but I just tell those people not to come visit if it bothers them because my dogs are all well behaved and get tons of love and exercise so to me that is all that matters.